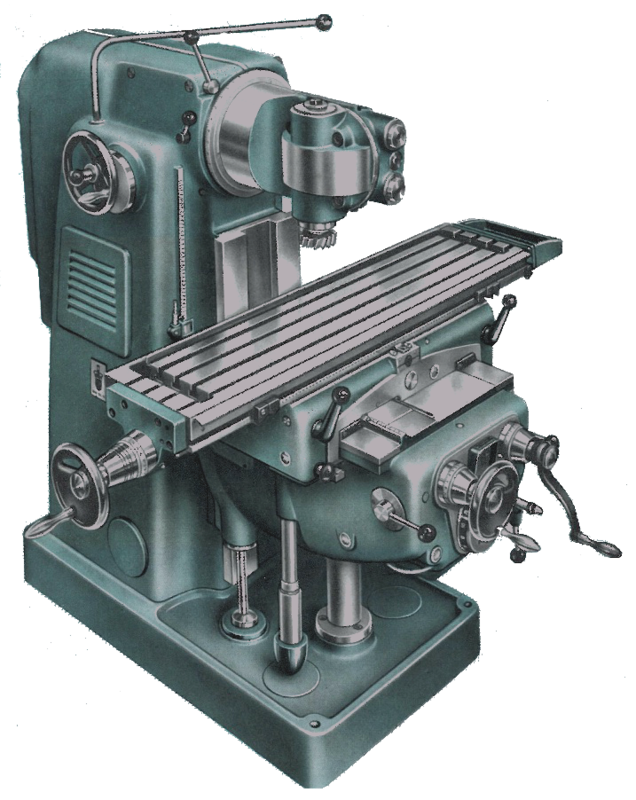 Built between 1951 and 1991, the Schaublin 53 was the largest machine in Schaublin’s manual machine programme. During this 40 year period over 3000 of these versatile, complex, and superbly made machines were built. Rather than employing the more usual “continental pattern” favoured by firms such as Deckel or Aciera, Schaublin opted for what initially appears to be a more conventional knee-type design. However, while the arrangement of the machines axes was quite conventional, the use of a huge 240mm diameter ground cylinder to carry a universal milling head was not. The cylinder could not only be rotated with a hand-wheel on the left of the machine, but, by axially shifting a rod in the centre of the hand-wheel, the cylinder could be traversed 300mm. 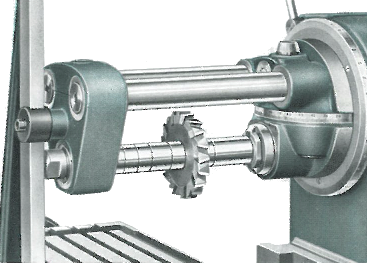 A indexing device allowed the milling-head cylinder to be positioned at 15 degree intervals. 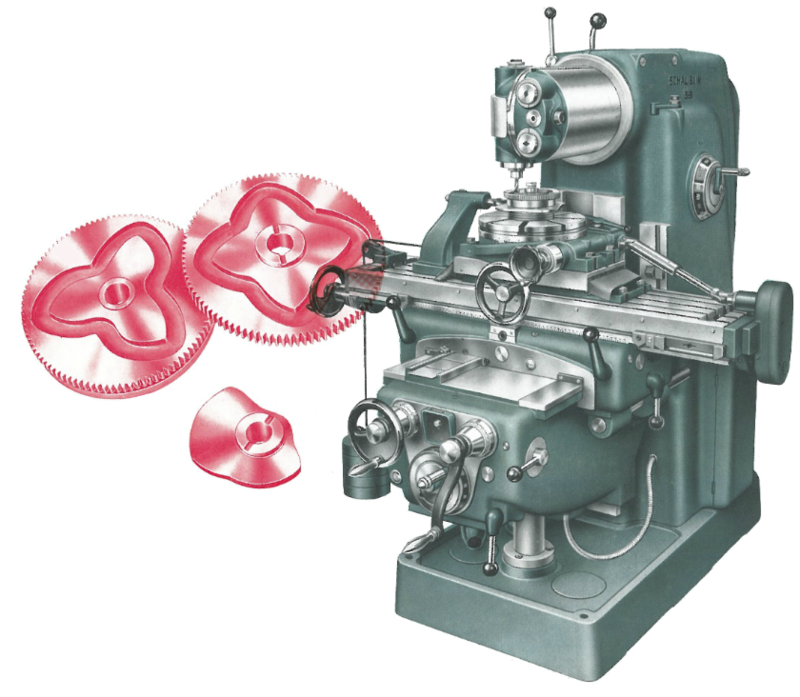 Gear-driven through the cylinder, the milling-head could be rotated through 360 degrees, and this, in combination with the rotation of the cylinder, allowed the cutter to be placed at any angle relative to the table. The spindle itself accepted ISO 40 tooling at one end and P25 collets at the other. Lubrication of the moving parts of the cylinder and milling head was provided by a small compressor and mist lubricator. For horizontal work the milling head was simply rotated until it was in the same axis as the cylinder. Two 50mm cylindrical bars were housed withing the milling-head cylinder which could be withdrawn to form an overarm with a separate casting, which along with a vertical brace that connected to the knee, formed part of the standard equipment. Contained within the machine’s frame were the main motor, the spindle gearbox and clutch, the mist lubrication system, and coolant system. 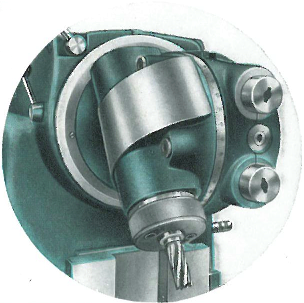 With the motor running, the spindle rotation was engaged via a lever-operated clutch which transmitted power to the gearbox. Selectable through a lever and dial type arrangement, the eighteen spindle speeds ranged from 38-1510 rpm with the standard non-sliding quill head. 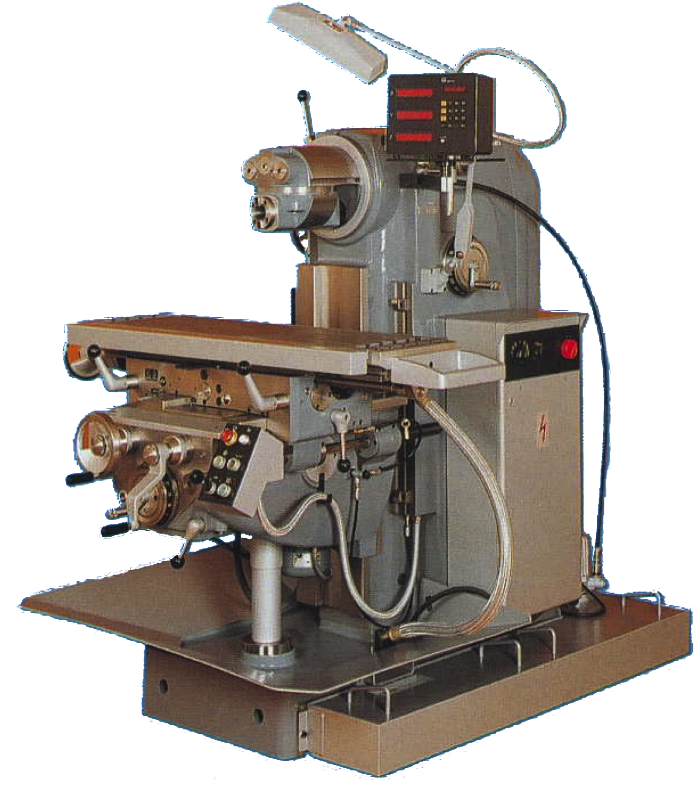 A high speed head, with sliding quill accepting E25 collets, gave speeds from 150 to 6000 rpm. Shifting speeds could only be achieved with the spindle stopped. Carried on the frames’ substantial rectangular section vertical ways, the knee featured rectangular ways for the cross (y) slide and dovetails for longitudinal slide (x) of the 1100 x 255 millimeter table. With travels of 700mm (x) by 250mm (y) and 430mm vertically (z), feed controls were all conveniently located at the front of the knee including the feed gearbox selector giving 18 rates of feed for all three axes. A push-button control actuated the independently motorised rapids to the engaged feed(s). 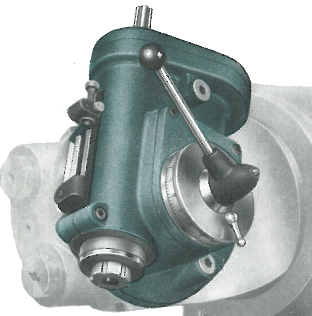 A typically comprehensive range of accessories including vices, dividing head, helical milling equipment, rotary table, high speed head(s), slotting head, and copying equipment was available to tackle the wide variety of jobs that the pre-CNC tool-room would encounter. In 1975 Schaublin introduced the 53N. At a glance the machine appeared virtually unchanged. However, improvements in the design included an increase in table width to 305mm (allowing an extra T-slot) and a small increase in headroom with an extra 60mm of vertical travel. Below the surface an extra motor now independently drove the power feeds which necessitated the displacement of coolant system to a separate external reservoir. A more complex electrical system was housed in an external cabinet attached to the right hand side of the frame. Always a substantial machine, improvements to the structure of the 53N took the weight from 1700kg to 2100kg.